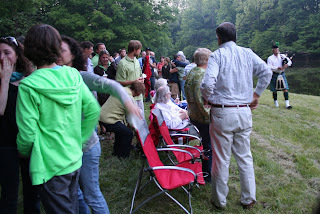 On Saturday, June 6, we gathered to remember Terry at the country place of friends Sara and John Trittipo. Terry made me promise there would be no traditional funeral, but he had listed things to include. There should be a bagpiper (playing "Amazing Grace"), it should be by water and there should be fire. Terry told me that what he really wanted was a viking funeral, so we adapted the concept to include his ashes on a small water vessel on a pond in this idyllic countryside. My sister, Heather Kish, worked very hard to coordinate the events that weekend; our friends and family were eager laborers to bring it all together. More than 150 people joined us, writing their good wishes and funny memories in the guest book. 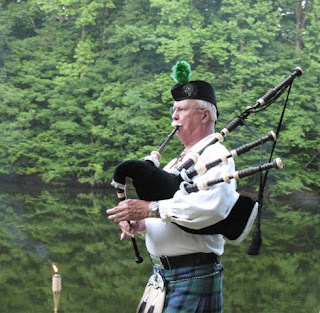 At 8:45 pm, the bagpiper led the way as Terry's brothers, Tim and Dave, carried the little boat that held Terry's ashes, along with reeds and grasses to help it burn. Behind them, I held hands and walked with Dale, Jace, Ed and Joan (Terry's parents); everyone followed us. When we were all gathered at the water's edge, Rev. David McDonald (friend and Phi Psi brother) spoke: he helped us remember Terry's humor, grace, and loyalty while also honoring his life and legacy. 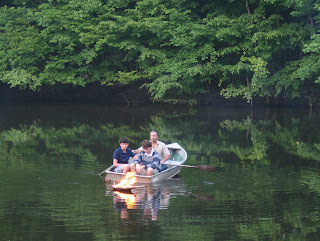 As we listened, my brother-in-law Steve Kish helped Dale and Jace into a metal rowboat at the dock. Tim and Dave handed them the small boat with Terry's ashes and the three men headed to the middle of the pond. Just before sunset, Dale and Jace placed the boat in the water and lit small torches that they laid on the grasses. It lit right away and cast a beautiful reflection on the darkening water. The bagpiper played "Amazing Grace" and, for a full five minutes, we watched the pyre float along the perfectly still water and listened to the music. When the fire burned out and the boat fell beneath the water's surface, Rev. McDonald closed the service and we all made our way back to the bonfire up the hill. People embraced and wept, some lingered to watch the water and the beautiful surroundings. We lit candles and gathered in lawn chairs around the roaring blaze. The rest of the evening was filled with stories about Terry, humorous memories of his antics, and the Phi Psi brothers in attendance singing "Amici," the Fraternity song. Our friend's dog Lupen barked and jumped during the entire song, prompting several of us to insist that Terry had found a way to join us after all. On Sunday, June 7, we held Terry's Party: he had always insisted that there should be fun and celebration, not tears and sadness. So we celebrated Terry's life by including things he loved in a place he loved. At the Woodruff Place Town Hall (the gathering spot for our neighborhood), we hosted more than 300 friends and family with sushi, karaoke, and Maker's Mark (the true bourbon). Dale and Jace played a few songs with The Key Strummers, a children's ukulele band that Dale first joined in fourth grade. 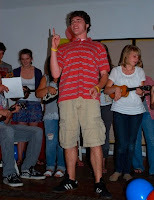 Here is a shot of Dale during his solo, "I Like Mountain Music." The guests looked at Terry's life in photographs and shared stories and anecdotes for more than three hours. For the more mature attendees, there was a CD of out-takes from an audio recording Terry had made a few years ago. The finished product was used at an SPJ awards banquet; the leftover cursing and screw-ups were captured on CD with a backdrop of lively music. In a word: hi-larious. The kids kicked off karaoke about 8:30 and soon everyone was joining in. Several people asked where we got the karaoke machine; my answer: from our living room. We use it regularly in our family of hams! It was great fun to see Terry's spirit come alive on stage through renditions of Jon Bon Jovi, Frank Sinatra, and everything in between. 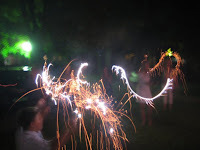 We closed the night back at our house with the last 20 or so people lighting sparklers in a circle on our front lawn. We burned 100 sparklers continuously, until the last box was empty. 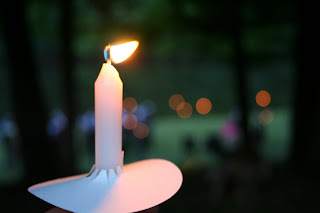 It was a great way to end the celebration of a life that burned brightly and was extinguished far too soon. I have absolutely no idea how I found your blog, probably one blog leading to another, I suppose. In any case, I have to say that it's been a joy to have "met" Terry through his many posts. What a beautiful life and even in his death, his spirit comes forth. I can only imagine how lovely the bagpiper was to listen to, and the burning boat sounds fantastic. You'll have these memories always, but I am so very very sorry for your great loss in losing Terry. He seemed like a wonderful man. Thanks for sharing this with us. I heard about Terry through the AOl story and I quickly learned that Terry was a special man, you and your family were so very blessed...GODSPEED Terry! Thanks for sharing the details of the services with those of us who could not attend. I missed the sparkler part on Sunday night! What a great way to end the weekend. Thank you, Lee Ann (and Heather) for all of your hard work in memorializing Terry. It was an honour to be there. I will toast the Fave Cousin with Maker's Mark for the rest of the time I am on this earth. Thanks for shring Terry's lovely service with us. What beautiful pictures of the festivities. 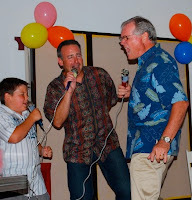 I will always remember Terry's singing voice, it will never be forgotten. Terry seemed like a wonderful, amazing person! I found his blog from the aol news story too! God Bless!! A life well lived, indeed. I only wish I had gotten to know him better since he was my cousin, but I do feel, like so many have expressed, that I "met" him through his blog posts and found his spirit for life to be unquenchable, even in his passing from this life. 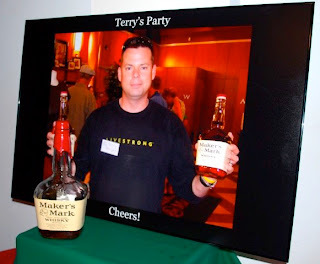 We will continue to commemorate Terry later this summer at the "Harper Hootenanny", where we'll raise many a glass of Maker's Mark to his memory. We know that he'll be there with us in spirit, even if he isn't there with us physically. I'm quite sure he'd very much appreciate our doing that for him. Sunday night's activities sound like they were just perfect. I'm sorry I couldn't stick around for the gathering, Lee Ann. I'm hopeful that the summer's transtion time is helpful of easing the burden. Thank you for sharing. 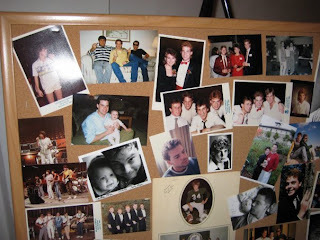 I lost my husband Mark, in 2001 at age 45 after 23 years of marriage. I feel your pain and send prayers and love to you at this time. I too have no idea how I found this site. I have read Terry's blog and find so much inspiration in his words and strength. I am the same age as Terry. I have two young boys. My heart breaks for you and your childen. My heart is over joyed by what a wonderful man you experienced. I wish you peace and love. You will see him again. Brim over I assent to but I think the collection should have more info then it has. I bought 800M iPhone stereo headsets off eBay and haven't recieved them yet and I was wondering what's the difference between them? I am in tears as I finish reading this blog. I can't recall how I found it, but I have spent the last two days reading it from start to finish. Terry sounds like he was such a joy to be around. He was right about his wit! 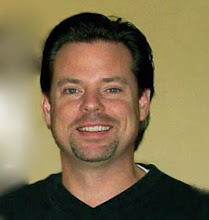 Lee Ann - I can't imagine what you are going through, but know that as much as Terry inspired me through this blog, you have inspired me, too. He was so very lucky to have you and his two wonderful sons. I inclination not agree on it. I over warm-hearted post. Particularly the designation attracted me to read the intact story. Opulently I agree but I think the brief should have more info then it has. melonthump.blogspot.com; You saved my day again. Do you guys watch movies in theater or on internet? I use to rent DVD movies from [b]Bigflix.com[/b]. Recently I discovered that we can watch all new movies on internet on day, they are released. So why should I spend money on renting movies??? So, can you guys please tell me where I can [url=http://www.watchhotmoviesfree.com]watch latest movie Cheech & Chong's Hey Watch This 2010[/url] for free?? I have searched [url=http://www.watchhotmoviesfree.com]Youtube.com[/url], [url=http://www.watchhotmoviesfree.com]Dailymotion.com[/url], [url=http://www.watchhotmoviesfree.com]Megavideo.com[/url] but, Could not find a good working link. If you know any working link please share it with me. if you guys exigency to conjecture [url=http://www.generic4you.com]viagra[/url] online you can do it at www.generic4you.com, the most trusted viagra drugstore repayment pro the asset generic drugs. Frame the animal with two backs casinos? examine this contemporary [url=http://www.realcazinoz.com]online casino[/url] advisor and wing it denigrate online casino games like slots, blackjack, roulette, baccarat and more at www.realcazinoz.com . you can also delay our new [url=http://freecasinogames2010.webs.com]casino[/url] direct at http://freecasinogames2010.webs.com and overwhelm true spondulix ! another new [url=http://www.ttittancasino.com]casino spiele[/url] place is www.ttittancasino.com , because german gamblers, fetch manumitted online casino bonus. I would appreciate if a staff member here at melonthump.blogspot.com could post it. I have a inquiry for the webmaster/admin here at melonthump.blogspot.com. May I use part of the information from this blog post above if I provide a backlink back to this site? Here are some of my favoriate songs: Life After You - By Daughtry, Haven't Met You Yet - By Michael Bubl, Enter Sandman - By Metallica, Thirteen - By Big Star, Lay Me Down - By Dirty Heads, I'm Awesome - By Spose, Oh - By Pretty Woman, For What It's Worth - By Buffalo Springfield, Use Somebody - By Kings Of Leon, There Is A Way - By Newworldson, What's Love Got To Do With It - By Tina Turner, Walk This Way - By Run-DMC, Get Back Up - By Tobymac, All The Way Turnt Up - By Roscoe Dash, Monkey Gone to Heaven - By Pixies, Why Do Fools Fall In Love - By Frankie Lymon and the Teenagers. You can listen to these [url=http://all-free-music-downloads.com/]Free Music Downloads[/url] Online for free. Due to innumerable cultural, social, and religious reasons, a video game which is considered perfectly fine in one place can be criticized once released in a new territory. This is a good reason to thin that video game adaptation - unlike just straight translation - is extremely important for video games. I will show you a simple example, Yakuza 3 on PS3 shows well how thin the frontier between censorship and localization can be. The game was heavily criticized by gamers who suspect the localizerd edited or removed significant game elements. Video game localization is an important process to bring games to new people, and shouldn't be taken that lightly. Here is a list of my favoriate songs: She Won't Be Lonely Long - By Clay Walker, He's Gone Away - By US Air Force Singing Sergeants, Young Blood - By The Coasters, Stayin' Alive - By The Bee Gees, Lay Me Down - By Dirty Heads, Say Aah [feat. Fabolous] - By Trey Songz, Loser - By Beck, Bitter Sweet Symphony - By The Verve, Whatcha Say - By Jason Derulo, Resistance - By Muse, Tangled Up in Blue - By Bob Dylan, Wake Up Little Susie - By The Everly Brothers, Halfway Gone - By Lifehouse, Life After You - By Daughtry, Mack the Knife - By Bobby Darin, Why Do Fools Fall In Love - By Frankie Lymon and the Teenagers. You can listen to these [url=http://review-music-downloads.com/]MP3 Music[/url] Online. Here are some of my favoriate songs: Life After You - By Daughtry, When I Look At You - By Miley Cyrus, The Thrill Is Gone - By B.B. King, Stand By Me - By Ben E. King, Get Back Up - By Tobymac, Billionaire [Feat. Bruno Mars] - By Travie McCoy, Walk on the Wild Side - By Lou Reed, La Bamba - By Ritchie Valens, Speedin' - By Omarion, In My Head - By Jason Derulo, Street Fighting Man - By The Rolling Stones, Walk This Way - By Run-DMC, Nothin' On You [Feat. Bruno Mars] - By B.o.B, Need You Now - By Lady Antebellum, I Put a Spell on You - By Screamin' Jay Hawkins, Why Do Fools Fall In Love - By Frankie Lymon and the Teenagers. You can listen to these [url=http://my-music-downloads.com/]Free MP3 Music[/url] Online for free. I am really Glad i ran across this website.Added melonthump.blogspot.com to my bookmark!